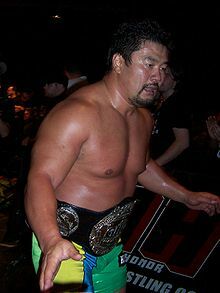 1 Sasaki won the championship in Tokyo, Japan as part of an interpromotional card between New Japan Pro Wrestling and World Championship Wrestling. ↑ 1.0 1.1 "Pro Wrestling llustrated 500 – 2004 :72 Kensuke Sasaki". Pro Wrestling Illustrated. Blue Bell, Pennsylvania, United States: Sports and Entertainment publications LLC. October 2004. p. 26. December 2004. ↑ "All Asia Tag Team Title (Japan)". Wrestling-titles.com. สืบค้นเมื่อ 2016-01-15. ↑ "Unified Triple Crown Heavyweight Title (Japan)". Wrestling-titles.com. สืบค้นเมื่อ 2016-01-15. ↑  Archived พฤษภาคม 6, 2008 ที่ เวย์แบ็กแมชชีน. ↑ 6.0 6.1 6.2 6.3 6.4 "Purolove.Com". Purolove.Com. สืบค้นเมื่อ 2016-01-15. ↑ Axel Saalbach. "Wrestlingdata.com - The World's Largest Wrestling Database". ↑ "World Magma the Greatest Title". Wrestling-titles.com. สืบค้นเมื่อ 2016-01-15. ↑ "HCW Heavyweight Title (Hawaii)". Wrestling-titles.com. สืบค้นเมื่อ 2016-01-15. ↑ "HCW Tag Team Title (Hawaii)". Wrestling-titles.com. สืบค้นเมื่อ 2016-01-15. ↑ "Tohoku Tag Team Title (Japan)". Wrestling-titles.com. สืบค้นเมื่อ 2016-01-15. ↑ "Heavy weight class一覧｜王座変遷｜DataBase｜新日本プロレスリング". Njpw.co.jp. สืบค้นเมื่อ 2016-01-15. ↑ Royal Duncan & Gary Will (2000). "Japan: New Japan G-1 (Grade-1) Climax Tournament Champions". Wrestling Title Histories. Archeus Communications. p. 375. ISBN 0-9698161-5-4. ↑ 15.0 15.1 "2000 New Japan Awards". Strong Style Spirit. สืบค้นเมื่อ 2011-04-28. ↑ "Strong Style Spirit". Puroresufan.com. สืบค้นเมื่อ 2016-01-15. ↑ "Pro Wrestling Illustrated Top 500 – 1998". Pro Wrestling Illustrated. Wrestling Information Archive. สืบค้นเมื่อ 2009-03-13. ↑ "Pro Wrestling Illustrated's Top 100 Tag Teams of the PWI Years". Pro Wrestling Illustrated. Wrestling Information Archive. สืบค้นเมื่อ 2009-03-13. ↑ "Pro Wrestling Illustrated's Top 500 Wrestlers of the PWI Years". Wrestling Information Archive. สืบค้นเมื่อ 2010-09-15. ↑ "GHC Heavyweight Title (Japan)". Wrestling-titles.com. สืบค้นเมื่อ 2016-01-15. ↑ "GHC Tag Team Title (Japan)". Wrestling-titles.com. สืบค้นเมื่อ 2016-01-15. ↑ "Stampede International Tag Team Title (Alberta & Saskatchewan)". Wrestling-titles.com. สืบค้นเมื่อ 2016-01-15. ↑ 25.0 25.1 25.2 25.3  Archived ตุลาคม 16, 2012 ที่ เวย์แบ็กแมชชีน. ↑ "The World's Largest Wrestling Database". Wrestlingdata.com. สืบค้นเมื่อ 2016-01-15. ↑ "Kensuke Sasaki". WWE.com. สืบค้นเมื่อ 2016-01-15. ↑ "Caribbean Tag Team Title (Puerto Rico)". Wrestling-titles.com. สืบค้นเมื่อ 2016-01-15. ↑ Meltzer, Dave (November 6, 2013). "Nov 6 Wrestling Observer Newsletter: 2013 Hall of Fame issue with several new inductees". Wrestling Observer Newsletter. Campbell, California: 1. ISSN 1083-9593. หน้านี้แก้ไขล่าสุดเมื่อวันที่ 2 มกราคม 2562 เวลา 02:58 น.